The Third Annual SIUE Department of Social Work Scholarship Gala will be held in the Morris University Meridian Ballroom on Saturday, March 21, 2009, beginning at 5:00 p.m. until 9:30 p.m. Tickets are $50 each or $350 for tables of eight. A portion of the ticket price is used to fund "Social Work Alumni and Friends Scholarships and the scholarship endowment. For tickets, contact Judy Zimmerman at (618) 650-5429. 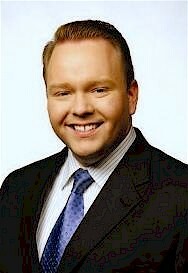 Matt Chambers, Channel 4 KMOV Meteorologist, will be the keynote speaker for the 2009 scholarship fundraising event. Chambers is a member of both the American Meteorological Society (AMS) and the National Weather Association (NWA), and he holds the Television Seal of Approval from the AMS. Matt is a certified National Weather Service storm spotter. His on-air talents were recognized by the Missouri Broadcasters Association with an award for "Best Weathercast" in 2002. Two years later, in 2004, Matt received a second award from the Missouri Broadcasters Association in the category of "Best Children's Programming" for his work as the head of KRCG's Weather Scouts program. The 2009 SIUE Social Work Gala Committee is comprised of Kellene Hamilton, Chair; and members Deborah Vogel, Jane Vest, Nancy Vetter, Sandra Becker-Warden, Shirley Rakers, Kathleen Tunney, and Judy Zimmerman.